With the summer of 2016 passing by at an alarming pace, I think it is important to take a few moments away from the enchanting beauty of Georgian Bay and review a number of the key elements that have characterized 2016's breathtaking advance in gold, silver and the associated mining, development and exploration stocks. While gold bullion is ahead 26.6% year-to-date, the gold mining stocks have demonstrated their incredible contained leverage and why, when the market operates properly, they are vastly more rewarding than the physical metals themselves. However, the 2016 advance has had many analysts questioning the integrity of this latest move as the HUI (NYSE Arca Gold BUGS Index) and the XAU (Philadelphia Gold and Silver Index) have defied gravity, the laws of physics, the Law of Diminishing Returns, and just about every other law that historically pertains to the behavior of stocks. Every single one of my colleagues in the business of precious metals investment has been bucked off this rampaging bull at least once or twice this year while the quality of portfolio content is doing what it always does as the advance occurs: the Barrick Gold Corps (ABX:TSX; ABX:NYSE) and Newmont Mining Corps (NEM:NYSE) of the world are being replaced by Foo Foo Mines and No Name Resources on the assumption that the leverage in owning a 20-cent penny explorer is superior to owning a company actually producing and selling gold and silver. This dangerous tendency is referred to as "trickle down," where one takes a premature profit on a large-cap name and realizing the error, replaces it with a mid-cap that also gets turfed too early, being again replaced with a small-cap, and so on and so forth until you wake up one morning and realize that your entire net worth has wound up in the hands of 10 or 15 masterful Vancouver promoters. And that is a nightmare scenario because the primary corporate objective of the typical Vancouver promoter lies not in the realm of a new gold discovery or near-term cash flow or added reserves, but rather in the novel concept of "distribution" and by that I don't refer to the "distribution" of profits to shareholders by way of dividends but rather the distribution of the one-cent paper they manufactured when they put the shell together. Before I am assailed by my West Coast friends for improperly and unfairly disparaging these "entrepreneurs," there are plenty more where they came from in Toronto, London, New York and Melbourne, so every so often, take a peak at your holdings and try to review the quality of the holdings. Any portfolio carrying over 50% content listed on the TSX Venture Exchange (TSX.V) should be pruned and upgraded immediately (although the temptation to take that last "flyer" on Glitter Gold or Lastchance Lithium can be overwhelming). Before I launch into another tirade on these constant interventions and manipulations going on daily in every market on every continent on the planet, I want to display a number of charts that will, I believe, put valuations for gold and silver companies into a more palatable perspective. Look at this two-year chart of VanEck Vectors Junior Gold Miners ETF (GDXJ) that I have owned since mid-late-2015 at an average entry point of around $17. From the chart below, latecomers to this golden jamboree of a party are thinking that they "missed it" and are rather reluctant to take the plunge. 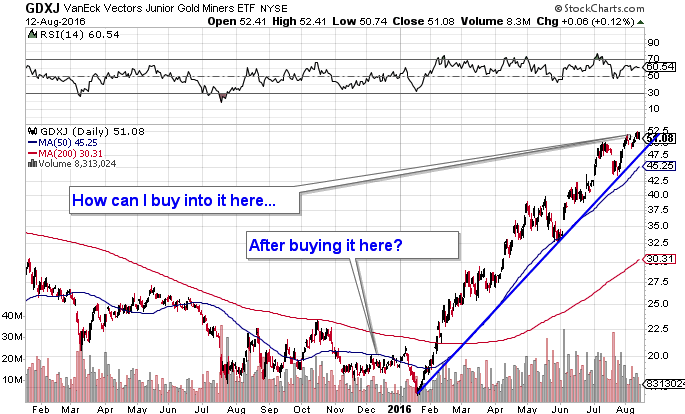 To wit, if you are anchored in the 2016 trading period only, you are most certainly afflicted with financial vertigo as the dizzying moves in the big name gold and silver miners have been simply awesome. Now take a look at the same ETF going back to 2009 that depicts the severity of the 2011–2016 bear market and the recent recovery. There are two important takeaways from the six-year chart. The first is that the GDXJ appears to be well ahead of gold in terms of valuation, but since gold and silver stocks ALWAYS lead gold and silver bullion prices, the GDXJ's performance year-to-date bodes very well for the outlook for physical metal prices into Q4/2016 and beyond. The second takeaway is that as long as gold and silver bullion stay within their well-defined uptrends, the GDXJ could have another triple in it before the "crazies" show up. This is the reason I was running around like a rabid Saint Bernard last fall and early winter to the point where my antics were making Cujo look like Lassie. The evidence is irrefutable: the depth of the 2011–2016 bear market is what set up this massive rebound and subsequent bull move and based upon the amplitude of the collapse, the GDXJ has a lot farther to go. And what about those penny stocks masquerading as "gold and silver exploration and development companies"? Are they really as dreadful as it appears from my earlier remarks? The answer is an absolute "No!" because despite my tongue-in-cheek ridicule of the TSX Venture Exchange, it is critical to remember that many (if not ALL) of the major discoveries of the last 35 years were germinated by the old Vancouver Stock Exchange (now the TSX Venture Exchange) with many life-changing fortunes made via the exploration successes of Barrick, Dia Met, Diamondfields, and more recently Goldcorp Inc.'s (G:TSX; GG:NYSE) $520 million acquisition of my 2015 favorite, Kaminak Gold. 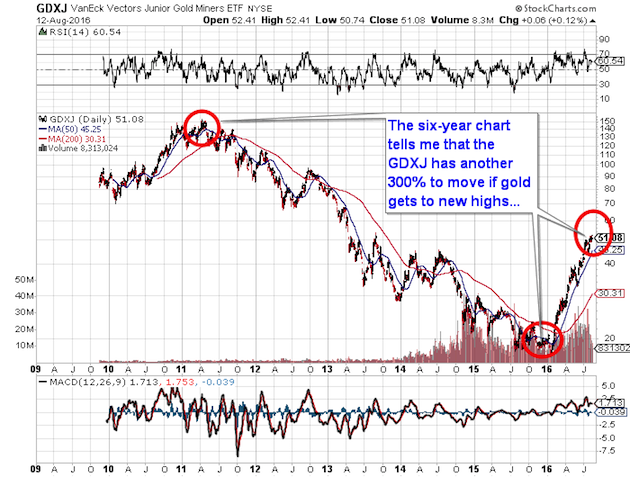 Similar to the illustration shown above for GDXJ, look at the chart of the TSX.V year-to-date. The TSX Venture Exchange started off timidly back in Q1 but as happens in all golden bulls, the speculative allure of the penny stocks has caught on with the TSX.V now up over 100% since January. Investors are today banging their heads on their desks, frustrated that their mid-caps are stock in a trading range while the penny dreadfuls are soaring. The problem lies in the fact that the internet grist mill of gargantuan marketing campaigns by the newsletter community are now inundating inboxes with every other form of social media blitzkrieg designed to pump and promote designated junior names for a "fee," which has been escalating sharply as the stakes behind "distribution" are recognized. Since the TSX.V is always the hardest-hit when the inevitable correction arrives, the doubling of values since last January has everyone trying to determine whether the leverage of the penny explorers outweighs the predictability of their more senior brethren. 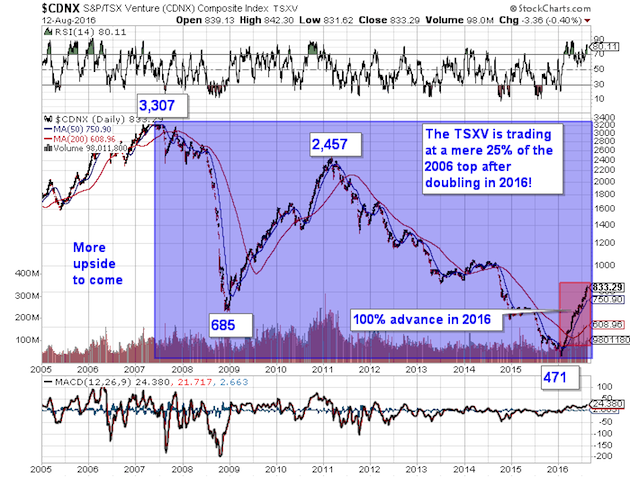 The chart below again depicts the severity of 2011–2016 but since I take it back to 2006, the point where the TSX.V reached its apex at 3,307, there can be no doubt that there is still considerable and undeniable upside remaining, albeit with enhanced risk and added volatility. The last two weeks of the month of August is typically a slow one in North America with most people on holidays trying to squeeze in the last days of what is an exceedingly short summer, especially north of the 49th Parallel, where the sight of a turned leaf in August can bring on depression. For gold and silver investors, it should be viewed as a strategic accumulation period where illiquidity creates opportunity. With diminished volumes, there are occasions where large blocks of stock come open at depressed prices so sharpen your pencils and focus your screens on the names that are what I call "Consensus Buys." Bob Moriarty of 321Gold.com recently put out a blockbuster commentary on Gold Standard Ventures Corp. (GSV:TSX.V; GSV:NYSE), which recently reported an impressive intercept in Nevada. 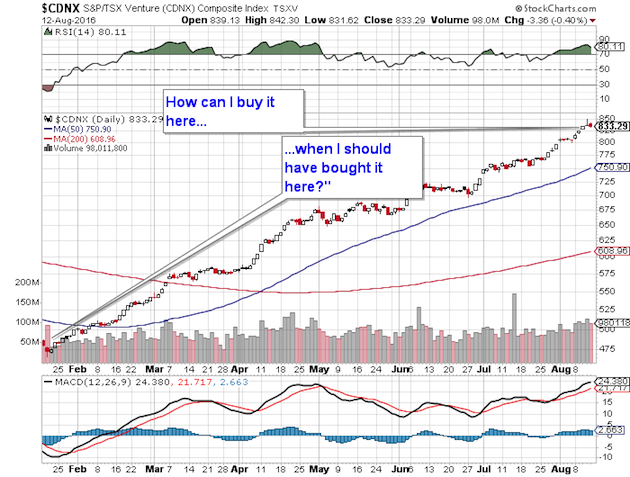 GSV is a company that I have followed for the past four years but have never recommended it and, sadly, never owned it. In the case of GSV, as I said with Kaminak all through 2014 and 2015, it is a company that now MUST be owned because the Nevada behemoths like Newmont and Barrick will NEVER allow GSV into their turf. I refrained from talking about the COT report because it was essentially a non-event but what WAS important was that despite the huge gold price drop into the August 3rd NFP (jobs) report, the Commercials have only covered a modest 11,086 contracts and are still short well over 300,000 contracts of synthetic gold. That means that the Cretins are going to pull out all the stops to crush the advance and will be thumbing their large, bulbous noses at us at every turn. In the end, the magic fiat manufacturing machines are going to go berserk and the average citizen is going to look at his or her 60% year-over-year increase in rent or food or electricity and then THEY will go "berserk" in their own fashion. Juicing asset prices while depriving the working classes of wage increases is criminal and dangerous and if you think for a moment that it won't be felt in North America and Europe, you had better give your collective heads a very large shake. The new generation is going to put an end to this devious monetary deception and all of the old "Champagne Socialists" sitting in the front of the aircraft debating the horrors of capitalism with two bankers and a parliamentary aide while sipping on bubbly, feet up and caviar on the side table, are ALL in for a very rude awakening. 1) The following companies mentioned in the article are sponsors of Streetwise Reports: Gold Standard Ventures Corp. The companies mentioned in this article were not involved in any aspect of the article preparation or editing. Streetwise Reports does not accept stock in exchange for its services. The information provided above is for informational purposes only and is not a recommendation to buy or sell any security. 2) Michael Ballanger: I or my family own shares of the following companies mentioned in this article: None. 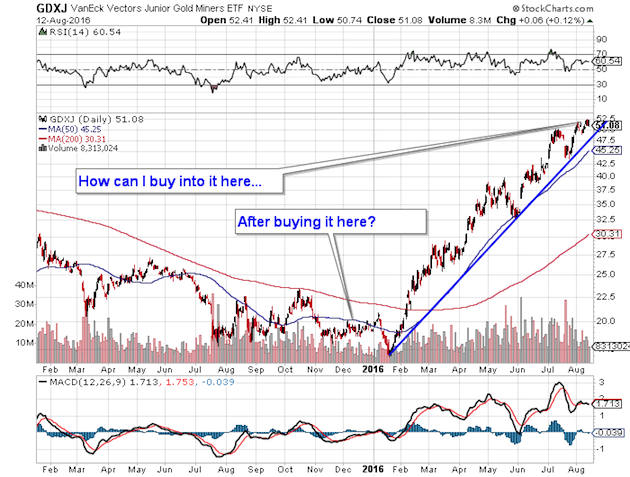 I do hold VanEck Vectors Junior Gold Miners ETF (GDXJ), which may hold some of the companies mentioned in this article. I personally am or my family is paid by the following companies mentioned in this article: None. My company has a financial relationship with the following companies mentioned in this article: None. I determined which companies would be included in this article based on my research and understanding of the sector. Average Gains of 11.35%. Want to Know Today's Pick? large trader announces that he will sell his position. what is his track record percentage wise from 2011 to 2015. I like your description of the metals market in your last paragraph; and I would also add a lot of Old Farts that agree with you!